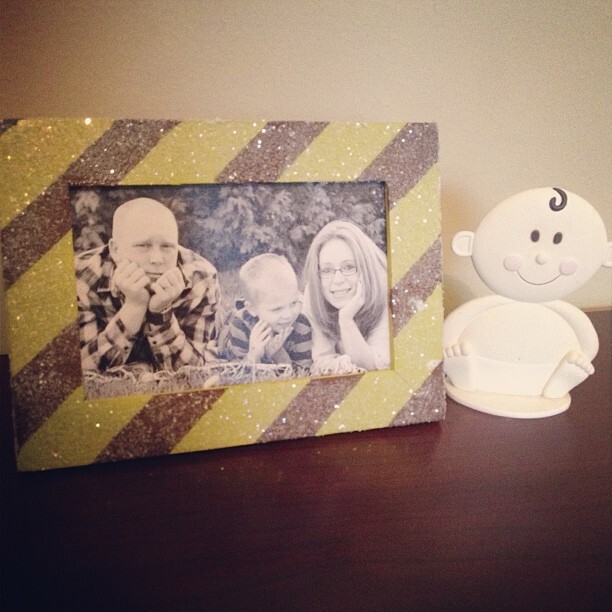 Before making the decision to try for baby #2, one of the big questions we asked ourselves was, "Can we afford it!?". As a single income family, we are naturally on a budget. Would we be able to add another child into that budget and still live comfortably? It's such a big question for many, babies are so expensive. But, we made the decision that our other reasons in favor of adding to our family were more important, and we would make the budget work. So, from the moment we found out we were expecting...I started looking for the deals! From consignments shops to online freebies to blog giveaways, etc...I've already managed to find a ton and have had many of my expecting mommy friends ask me how I've done it! So I wanted to take the chance to share some tips and deals to look out for. For today, I'm just going to focus on the nursery!! Let's face it- furniture is NOT cheap! 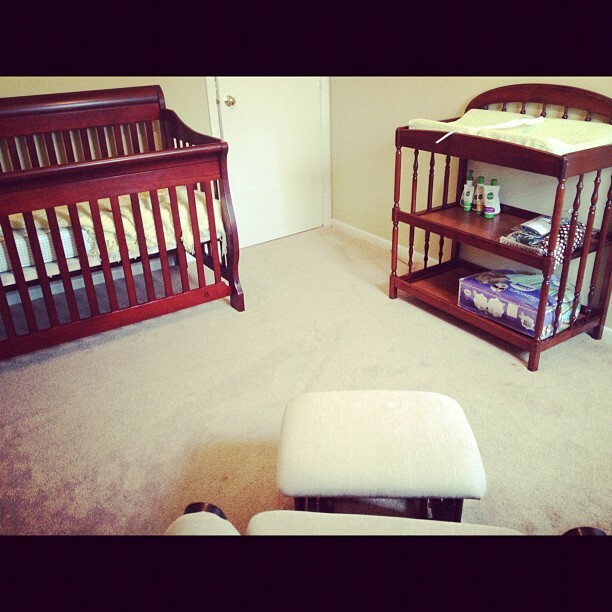 Cribs, changing tables, rocking chairs...it adds up quickly. I've mentioned before that I'm a huge fan of things like Craigslist and online yard sale sites, as well as yard sales and consignment shops. Of course, when it comes to cribs and things for baby, you definitely want to keep an eye on past recalls, new safety issues, etc...but if you're careful, these can be great options. You can often find barely used furniture for a fraction of what you'd pay in store, and there's not a thing wrong with it! We got incredibly lucky when it came to nursery furniture. When we first found out we were pregnant, my wonderful sister in law actually had offered up their crib to borrow for as long as we needed it. 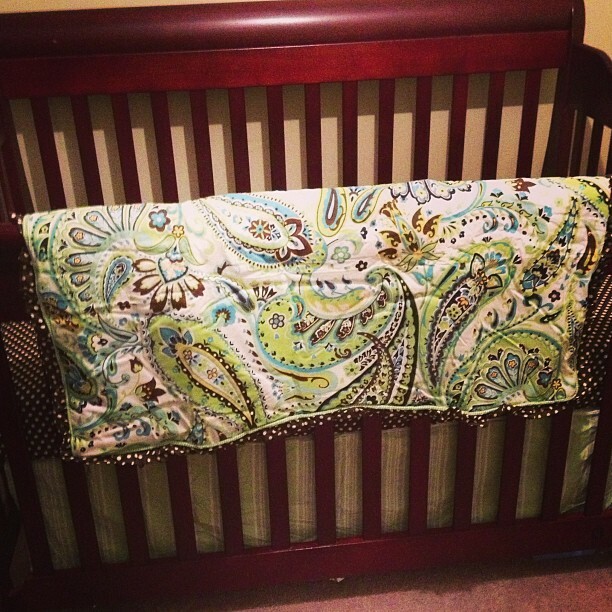 It was a gorgeous crib, and wasn't going to cost us a thing to use. If you have a friend or family member whose not planning on having more children who still has their crib, borrowing could be a great option! The only problem here was figuring out transportation from up around Chicago, to here! But before we had a chance to worry about that too much, we got another offer. A Navy recruiter that works in the office by my hubby's had a full set of barely used nursery furniture sitting in storage that he needed to get rid of, and wanted to let it go cheap to get it gone quickly...how cheap? $200 for EVERYTHING! That included a stunning crib (and crib mattress, though we opted not to take it since we already had another), changing table and pad (plus pad cover which actually matches our bedding too! ), night stand and glider and ottoman. What a deal! Though we already had a free crib worked out, this would include everything else we needed as well (all of which likely would have cost over $200 even without a crib anyway). Plus, it was local...so it was a no brainer! I am absolutely in love with our nursery furniture, and even more in love knowing we didn't have to break the bank to get it. You can't see the full glider and ottoman here, but it's gorgeous and oh so comfortable. 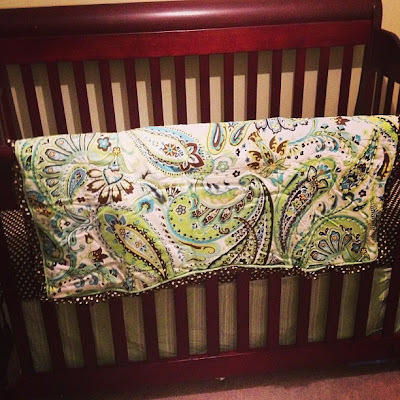 Have you ever looked at crib bedding!? It is crazy how expensive it can be, especially when you consider that most of it is for decorative purposes only (quilts and bumpers). So, how do you save on bedding? Of course the previous mentioned options are still decent options, but I know many aren't comfortable with used bedding...especially from strangers! But there are still some options for saving on new bedding too. First of all, obviously, watch for sales. Another thing to consider, ask if places offer any type of discounts. I recently discovered that Pottery Barn Kids offers a 10 or 15% military discount...of course their prices are still higher than most, but if you're set on something and can get it cheaper, every little bit helps! Another idea shared with me by a friend- if you find a quilt you love that's a bit pricier, rather than buying the set with more expensive sheets, etc, instead just buy the quilt and find cheaper coordinating options! A few weeks back, I posted a shot of our crib bedding and mentioned that I got an AMAZING deal on this bedding set...so today, I'm going to share that secret with you. This three piece bedding set by My Baby Sam retails for $130!! I paid just $13 out of pocket! How!? Amazon Warehouse Deals. Did you know that Amazon offers some 'open box' items for DEEPLY discounted prices? I didn't either! I was randomly browsing bedding a few weeks back and spotted this stunning bedding and noticed under buying options it listed there was an 'open box' for just $33. It was brand new, but the package had been opened (this is usually because of returns...or in stores, it may be a floor model, etc). At just $33, it was already a great deal- almost $100 off retail, but to make this an even better deal, I happened to have a $20 Amazon code from a sponsored blog post I'd been holding onto, so it dropped the out of pocket cost down to just that $13 and some change (and it shipped free!). While some of their warehouse deals are used items, I've found that if you look at the baby items, most of those are just open box. And I have to tell you, I would never have guessed that this bedding had been opened anyway- it was still in the original bag and looked fantastic! (And had Amazon's regular return policy anyway!) I've looked a few times since and while I haven't noticed any SUPER deals like this one, there are definitely a ton of great discounted items, and definitely worth checking out! How did I not know about this before!? I will take better photos when the nursery is actually complete, but how absolutely stunning is this!? And for $13, how could we pass it up!? I'm a believer! We still have a long way to go on the rest of the nursery (and are waiting until we find out if baby is a boy or girl to decide what direction it needs to go in), but another way we intend to save some more money is with some DIY decor projects. All those little decorative accessories that really complete a room can really add up! I'm still decided exactly what I'd like to do, but so far I'm thinking painted letters for the wall, some cute frames...well, the possibilities are endless. These personal homemade touches will also make the room 100% unique too! I can't wait to do more with it!! A simple frame I'd made for the room. Nothing fancy, but adds a nice little personal touch! Our total cost for the nursery so far? Just $213!!! Wow! These are just a few ways we've found to save money on the nursery, I know there are many, many more! Have you found other great money saving options? I'd love to hear them!